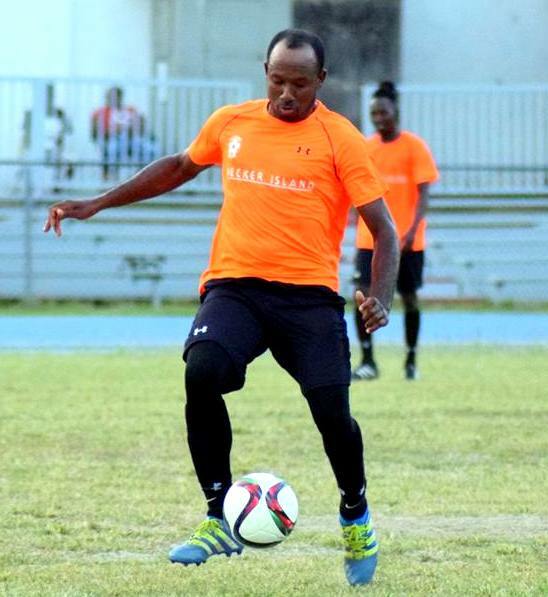 BVI Football Association » The points were shared between the top two clubs in the FA National League, the Sugar Boys F.C. and One Love F.C. in a six-goal thriller on Sunday 15th April 2018 over on the Virgin Gorda Recreation Ground. Mohammed Kachour had put the home side ahead in the 10th minute, Carl Stewart then equalized for One Love in the 34th minute. Okeyne Thenstead put One Love up 2-1 in the 52nd minute, Derol Redhead made it 2-2 in the 65th minute and Michael Castello restored the advantage to the hosts with his 68th minute goal making it 3-2, but almost as the home fans began celebrating another win, up popped Richard Morgan in the 85th minute to make it 3-3. The Sugar Boys have still to suffer defeat this season and top the table with 16 points, One Love are second on 13, but the surprise of the season so far occurred back on the A.O. Shirley ground, when against the odds, the Panthers F.C. snatched a 1-0 win over the Islanders F.C. The 3 points, courtesy of Nigel Saunderson’s 82nd minute goal puts the Panthers third on 7 points, whilst the Islanders and the Wolues F.C. share 4th on six points, with the Wolues losing 2-1 to VG Utd, who climbed up to sixth, in Sunday’s Prime Time game back on Virgin Gorda. Having gone 2-0 down, Jose Antonio scored a consolation goal for the Wolues in the 89th minute. This after Thomas Albert opened the scoring in the 52nd minute and Delano Barbour doubled the home sides advantage in the 84th.